Posted: Sunday, October 9, 2016. 4:05 pm CST. 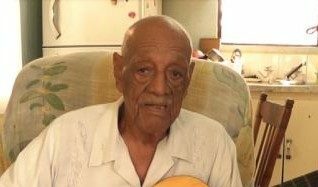 By BBN Staff: Alfred Pandy, the oldest citizen of Belmopan city passed away today. He was born on the 29th of June, 1918. He died at the age of 98. Mr. Pandy, in an interview with Plus TV News in 2014, shared that he had joined the army in 1939 for the second world war. He said it was called the Volunteer guard then changed to British Honduras North Caribbean force. In 1942, he went to Jamaica for training and returned as a drill instructor. After that, he would become a Commissioner Major in charge of Becombe. When the army dispersed in the 1940’s, he joined the prison service and became the Senior superintendent of the prison. He worked there for twenty five years then joined the public service. Gilda told BBN that today, he only faded away. He will be greatly missed by his relatives, friends and community.